All information presented on this website is meant solely for informational purposes. This website does not contain any advice or recommendation that may be relied upon as the basis for any action or decision. Reasonable care is being taken to ensure that the website content is accurate and up-to-date, but Malaysian Bulk Carriers Berhad makes no warranties or representations of any kind, whether express or implied, as to accuracy, sequence, timeliness or completeness of the website content. Any risk arising from the use of the information contained in this website shall rest with the recipient and nothing herein shall be construed as constituting any kind of warranty including but not limited to implied warranties of fitness for a particular purpose or non-infringement. Malaysian Bulk Carriers Berhad reserves the right to make adjustments without prior notification and to make changes or updates to this website at any time without notice. This website may be linked to other websites which are not under the control of Malaysian Bulk Carriers Berhad and Malaysian Bulk Carriers Berhad is not responsible for the availability and/or content of these other websites. In no event will Malaysian Bulk Carriers Berhad or its subsidiaries or associated companies be liable to any party for any direct, indirect, special or other consequential damages for any use of this website, or any other hyperlinked website, including, without limitation, any lost profits including goodwill, business interruption or otherwise, even if we are expressly advised of the possibility of such damages. The content of this website is protected by Malaysia copyright laws and/or subject to other intellectual property rights. 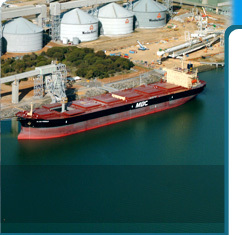 The company names, trade names, and logos displayed on this website are trademarks owned by Malaysian Bulk Carriers Berhad and/or its subsidiaries or associated companies and it is unlawful to copy, display, download, modify, reproduce and/or re-transmit any information on this website without the express prior consent of Malaysian Bulk Carriers Berhad. This disclaimer and the contents of this website are governed by and to be interpreted in accordance with the laws of Malaysia. Disclaimer | © Copyright 2010 Malaysian Bulk Carriers Berhad All rights reserved.